Guess who is pumping in the money to support CA Proposition 23 to roll back California’s global warming legislation? Yup, mostly its the companies that would be regulated when the law goes into effect. 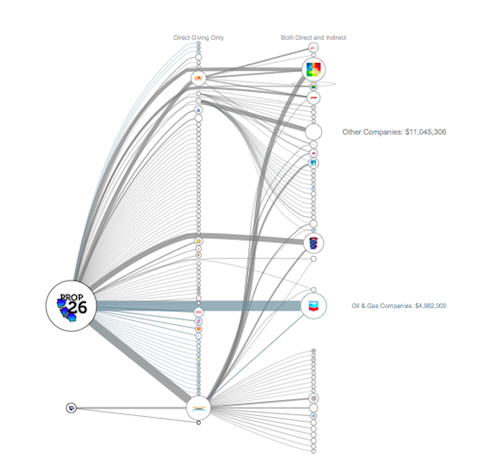 I’ve been working for the past few weeks to build prop23.dirtyenergymoney.com, an interactive network chart of the funding flows. Its an adaptation of our previous dirty energy money site, but using campaign finance data from California, and from OpenSecrets.org for the Federal PACs that are contributing in California. I think it is interesting to see the multiple layers, how the various group funnel in money and influence. 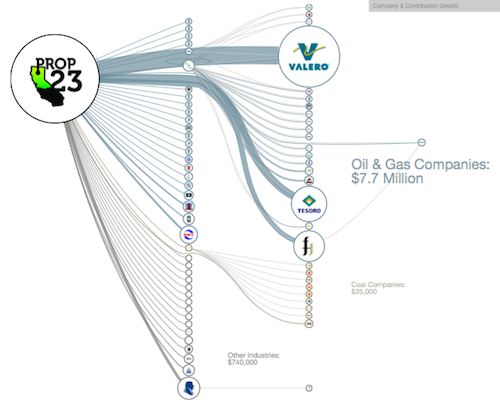 I hope to be able to do an expanded version which would also show some of the other strings that Koch is pulling, why Chevron isn’t investing in Prop 23 (it seems they are backing 25 & 26 instead), and the the backers of the various No on 23 campaigns. Also, can anyone help me figure out what happened to the $5000 contribution from Western Petroleum Marketer’s Association? It was in an earlier version of the data, but now seems to be missing from the filings. It seems that Tesoro may have solicited support for Prop 23 in their meetings, and I’d like to be able to include them.